Putting on a good pair of ice fishing bibs is a key part of preparing for a good ice fishing trip. In such cold weather, it is critical that you maintain your inner body temperature at an optimum level. That way, you will keep your responses sharp as well as stay comfortable in the biting cold. Just as important, you will be protected from the typical hazards that come with it – frost bite, hypothermia and such. Fishing bibs are very much a part of the attire you will be wearing to that end. This is the third installment in our ice fishing gears. We have already written about ice fishing gloves, ice fishing boots and ice fishing tip ups. When it comes to selecting a good pair of ice fishing bibs, there are some mandatory criteria to consider beforehand so that your choice of fishing bibs delivers exactly as advertised. Detailed below is a table featuring our top recommendations for the best ice fishing bibs you can buy. There are some critical elements that go into the making of a good pair of ice fishing bibs. Be sure to check out all of them to ensure that you end up with a quality product that enhances your experience and shields safe you from the elements. Let us now focus on what features go into the making of a good pair of ice fishing bibs. A key part of survival in a cold environment is keeping warm and an essential element of keeping warm is staying dry. For this reason, it is critical that ice fishing bibs stay absolutely water-tight. In extremely cold conditions, too much contact with water can be dangerous and keeping warm after getting wet is not easy. There are two different ways that bibs manage to stay waterproof. One is by the use of a water repellent and the other is using a waterproof coating. The upside with bibs that use the coating is they tend to be a lot cheaper to buy. However, there is a likelihood of them wearing off after some time and needing a reproof treatment. The water repellent method involves the use of a waterproof membrane. The technology is simple and elegant. The membrane features tiny microscopic pores which are big enough to be breathable but are too small to allow any water. In fact, both the water repellent and waterproof methods can be combined for increased efficiency. Keeping dry is only an elementary part of staying warm. Ice fishing bibs also have to be adept at retaining body heat as much as possible even in extremely harsh temperatures. First of all, you are not encouraged to test your product against very harsh temperatures. But even so, it is good to have that added assurance, that if you suddenly find yourself in a bad storm, your choice of bibs will keep vulnerability to a minimum. You should also determine if it can consistently keep you warm during long hours of fishing. As well as insulating body heat, you should also be able to move comfortably with little to no restriction. Check that the material is light and flexible. For an angler, being able to move freely could determine which way the battle goes. Also, a major part of ice fishing involves playing the waiting game so a single trip is also a rather long trip. Going through the whole thing inside a heavy, cumbersome bib would be a lot more exhausting and unnecessary than it needs to be. While they are typically designed to be used in strictly winter conditions, ice fishing bibs can be worn for cold conditions that do not involve snow and ice but are way too chilly to fish in any other type of suit. Before taking a look at the products, it would be great for you to assess the climate and terrain you will be fishing in beforehand. That way you can get a little more specific with your selection process and make it less of a guessing game. And now we can dive straight into the reviews. All of the items listed below have been selected based on how well they perform on all of the aforementioned criteria and they are all likely candidates for the best pair of ice fishing bibs you can buy. The Stormr Strykr Bib works in tandem with its matching jacket to offer almost complete insulation from head to toe. It features adjustable shoulder straps, a vented back panel, and two fleece-lined chest hand-warmer rest. All of the zippers are non-corrosive and splash proof including the main zipper and the ones lining two splash proof outer pockets. Waterproofing is further taken care of with full-length interior storm flap as well as glued, blindstitched and thermal taped seams. The Velcro waistband and ankle cuffs are both reinforced and adjustable. There are two cargo style gear pockets that also use velcro seals. The knee and seat area is reinforced and abrasion resistant. Different sizes available with these bibs are S-3XL, ML, LL, and XLL. This pair of bibs is extremely well built and well equipped. While it does have a lot of features integrated into the design, they do not really get in the way of mobility and limit muscle movement. You can still paddle freely and manipulate your fishing gear well. And with all its safety features, it can certainly keep you bone dry in a downpour. While there are a variety of sizes available with this bib, it can be difficult to choose the right one for you. The size chart can be rather misleading. DURABLE: Glued, Blind-Stitched and Thermal Taped Seams. FEATURES: Non Corrosive Waterproof Leg Pocket and Center Front Zippers. With its 320D Tussor 5000/5000 Waterproof/Breathable outer shell, the Striker Ice Climate Bibs is waterproof to the max. It has a removable 175-gram Thermadex insulated lining a Sureflote buoyancy material throughout the entire bib. It boasts some impressive features in the areas of comfort and flexibility. This includes articulated knees and infinitely adjustable leg cuffs that also make inseam length adjustable. Then there are 3-way waist-high YKK leg zippers, fleece-lined chest pockets, expandable cargo pockets, Soft Touch breast pocket for valuables, and 2 exterior D-rings for attaching accessories. The thigh pocket even has a built in beverage holder. Safety has not been overlooked either. There are water drains for getting rid of water if you happen to fall in and reflective tape on the front and back so you can be easily seen from far and in the dark. There are also magnetic storm flaps on the front and leg zippers, Boot storm gators with gripper elastic, adjustable suspenders and a new and improved crotch panel. All the fussing over comfort really pays off out in the field. This bib is so comfortable and warm that you may not even feel the cold sensation from a sudden gust even in sub-zero temperatures. The padding works just fine. The flotation technology is a real bonus as well. Practicality is good thanks to the ample supply of pockets. All the cool gizmos come at the expense of the whole thing being a bit bulky although this would be an inevitable criticism for a product so focused on keeping you warm. Still, it is not something you cannot get used to. The Huk Fishing NXTLVL All Weather Bibs, Neptune is more than capable of battling against the cold and punishment that Mother Nature throws at it. To keep it dry, cozy and not suffocating, it has a lightweight stretch 3-layer, waterproof 10,000mm / breathable 5000g shell. Plus, it has taped seams, waterproof zippers from the front zip, pockets, and heat dumping pit zips. A removable 3 piece articulated hood, with a shaped bill and draw cords at the front and rear offer vital level of dexterity with the fit. A hinged lock down closing mechanism in the cuffs help keep the water out and the collar features an air vent system to disperse any type of fogging. More safety is added with reflective material added to the shoulders, chest pockets and logos. All of its features work in harmony to keep anglers dry and safe from what would otherwise be a wet and sticky situation. There are not many situations this bib cannot handle. It has all the elements necessary for you to enjoy a worry free fishing trip out on the ice. So far, we simply cannot fault this one. The Frabill I3 Bib is teeming with advanced features and the best materials available. It is 100% sealed up and is completely resistant to water and wind courtesy of its 300 denier nylon Taslan shell. Crucially, it is breathable as well. It works in tandem with the 150 gram 3M Thinsulate insulation to provide solid protection from the elements. It does not run cheap on comfort either. It has full elastic shoulder straps with cam lock buckles, internal knee, and seat padding, hand warmer pockets with tricot lining, zipper vents which can be used to regulate temperature, multiple cargo pockets, and 3M scotchlite reflective material. Plus, you get a self-rescue set which includes ice pick holsters, ice safety internal label, and drainage mesh. This bib is more than capable of keeping you toasty for as long as you like. It has comfortable padding and excellent insulating technology and fits on you like a tailored suit. The one rather embarrassing flaw with this bib is in order to take it off, you will have to take it off all the way to our waist. That also means you will have to relieve yourself of your gloves and jacket as well. So bathroom breaks are certainly not something to look forward to while you have this on. The Frabill I2 Bib is 100% seam sealed and an entirely waterproof, windproof, breathable 300 denier nylon Taslan shell. It also comes with a Self-Rescue Feature set consisting of ice pick holsters, frabill Ice Safety internal label and a drainage mesh. A 3M Scotchlite reflective material provides additional safety. In the interests of comfort, there are full elastic shoulder straps with cam lock buckles, internal knee, and seat padding. The bib also boasts hand warmer pockets with tricot lining, zipper vents for temperature regulation. The department for practicality has YKK Zippers, 500 denier nylon reinforced knees and pant cuffs and tricot lining. This is a good buy for any prospect of ice fishing. It is well equipped with many reassuring safety features and the comfort level is right up there with other top competitors in the market. It is also made of high-quality materials which make it durable even in the harshest weather conditions. Not everyone can fit into it perfectly and it is not the best bib to be wearing when you have to use the loo. 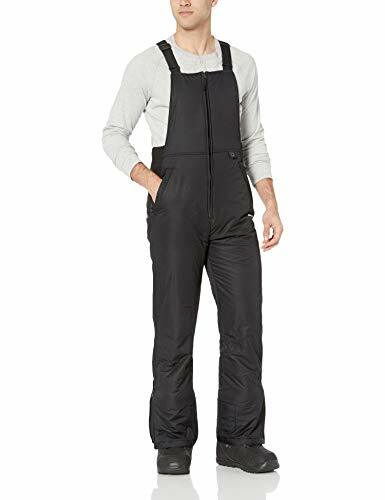 The classically styled Arctix Men’s Essential Bib Overall’s main asset is incredible value for money. It is water and wind resistant, and machine washable too. It affords impeccable protection and insulation from the environment without feeling too bulky and cumbersome to move in. The materials used to make it include 100% Nylon with thermaLock coating, which is great for durability. The suspenders are adjustable and further improve the fit with elasticized side gusts to make moving around effortless. The boot zippers make the whole thing easy to get in and out of. There are also the boot gaiters with grippers that form a perfect seal with the boots to keep the warmth in, and the moisture out. You also get reinforced scuff and hem guards as well as a D-ring for keys, gloves and/or life tickets. More good news is that these pants have zippered hand warmer style pockets. Its materials also make it less susceptible to wear and tear. Thankfully getting the sizing right with this one is a much simpler matter than with most other high-end ice fishing bibs. It is some great gear for your buck. The seams have been known to come out without enduring as much punishment as they are supposed to. 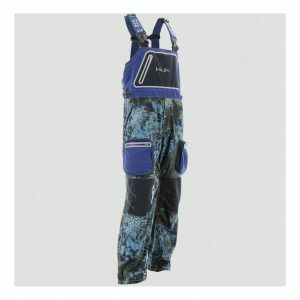 The ice fishing bibs listed above are some of the most efficiently detailed and convenient that you can buy from the modern market. Their design incorporates the crucial elements of safety, comfort, practicality, and durability you can expect to last for many fishing experiences on the ice.